BRIGHTON, Mich. - The Ford GT takes home the Top American Concept Vehicle Award, and these awards always focus on and recognize those vehicles most likely to shape the future of the auto industry as a whole. The fact that Ford's player in the sports car game is getting so much national recognition is super exciting! Each of the vehicle candidates were put through an intense selection process headed by more than two dozen jurors, and every vehicle nominated was introduced during this season's North American auto shows in Los Angeles, Detroit, Chicago, Toronto and New York. Finalists in the category included the Aston Martin Vulcan, the Buick Avenir and the Ford GT. 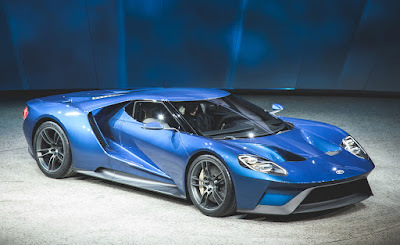 The Ford GT took home the 2015 Production Preview Concept award, which marked the brand's 20th time as a category finalist and the fifth time as category winner. One of the jurors stated that the "Ford GT is already one of the all-time great designs, with styling that is simultaneously breathtaking and aerodynamically functional. A car for the ages." The Ford GT takes home the Top American Concept Vehicle Award, which isn't surprising due to the national and international popularity the GT has been generating lately. The 2017 Ford GT will feature a stunning, next-generation twin-turbocharged 3.5-liter EcoBoost V6, and will produce more than 600 horsepower. The exciting EcoBoost engine will also be paired with a seven-speed dual-clutch transaxle for a near instantaneous gear change and exceptional driver control. The new GT will join other Ford models, the Focus ST, Fiesta ST, F-150 Raptor, Shelby GT350® and the Shelby® GT350R, as the latest addition to the Ford Performance lineup. At your local Hartland Area Used Car Dealer, we offer deals on New Cars and Used Cars, as well as Performance Cars. If you would like to see them up close and personal, feel free to stop by! Brighton Ford is located at 8240 Grand River Ave. just north of I-96 in Brighton. We are a family owned and operated business that strives for customer satisfaction. For more information on Brighton Ford visit BrightonFord.com or give us a call at (800) 836-8206.